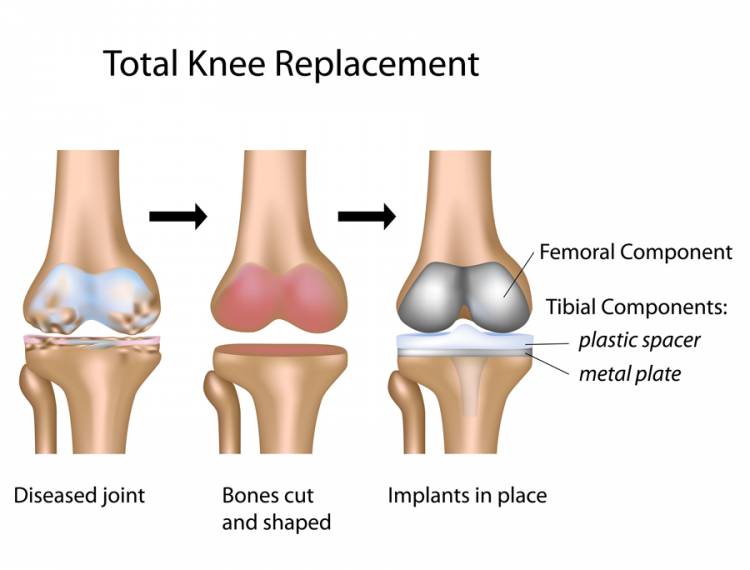 Knee replacement surgery, also known as an arthroplasty, is a surgical procedure to resurface a damaged knee. Although an arthroplasty is usually performed due to a knee damaged by arthritis, most commonly Osteoarthritis and Rheumatoid Arthritis, it can also be performed in response to external damage to the knee that results in arthritis. 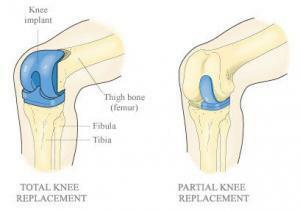 A knee replacement surgery is usually only performed when a knee is severely damaged. 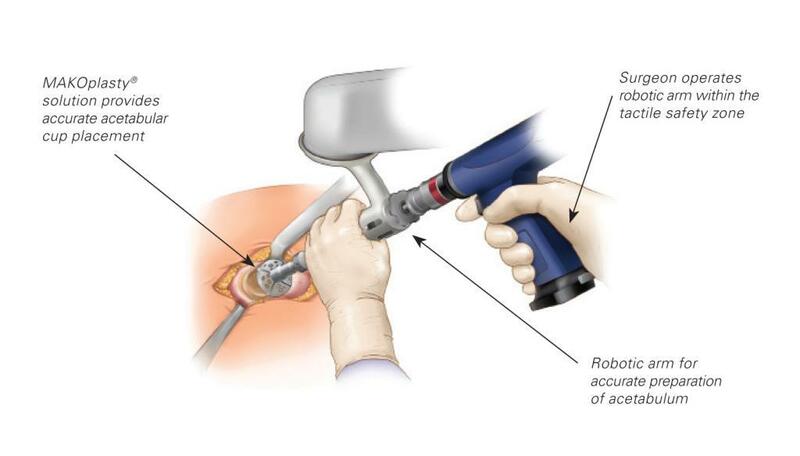 An arthroplasty that involves advanced robotics and CT imaging technology is known as knee replacement MAKOplasty. Although more costly than regular arthroplasty, knee replacement MAKOplasty delivers excellent consistency and results as surgeons are able to more reliably exert surgical control with the 3D imaging. You can find out more about knee replacement MAKOplasty here. Knee Replacement Surgery… MAKOplasty… and Arthroplasty? As mentioned above, the two most common conditions that result in an Arthroplasty is Osteoarthritis and Rheumatoid Arthritis. In both conditions, even though they both have very different mechanisms of action, both result in extensive damage to joint cartilage late into the condition’s progression. The lack of cushioning between bones in the joint leads to severe pain, preventing the affected individual from even bending their knee. The individual might not be able to even climb stairs due to the pain, and might ‘give-way’ or ‘collapse’ due to the weakness of the joint. Knee Replacement Surgery & MAKOPlasty – Where? Seeking help from either private or public medical facilities has numerous advantages and disadvantages on both sides. For private hospitals, the wait times are usually shorter, and you can be sure to be treated better, due to lesser burden being placed by the public on private medical facilities. The most surprising thing about doing a knee replacement surgery or knee replacement MAKOplasty in Singapore is that it actually does not cost that much since it is insurance claimable. Knee replacement surgery is a very advanced and technical procedure so if you are insurance covered, make sure you go to an experienced doctor. Dr Henry Chan is a reliable name and his clinic also advises on medical insurance claims so he’s a good option. If you google for awhile, you should be able to find other good doctors as well. For public treatment, you should expect a lower cost but a longer wait time. The wait could be a few months long so it is not usually recommended. It can be much cheaper though so if cost is a huge concern here, do visit the government hospitals. Note that not all government hospitals might provide option for knee replacement MAKOplasty. This list is not meant to be exhaustive. Discuss with your doctor carefully before deciding on knee replacement MAKOplasty or surgery. He will be able to better inform you of the risks and benefits involved. Medical preparations would have already been taken prior to the surgery in order to ensure your safety during the administration of General Anaesthesia. It is rare but not unheard of for Localised Anaesthesia to be administered alone during a knee replacement surgery or MAKOplasty. After being wheeled into the operating room, you will be put to sleep. Doctors and nurses will be looking after you while you are unconscious, constantly monitoring your vitals. The procedure will be carried out once you are unconscious. You will awaken once the procedure is completed. You will be allowed to recover in the hospital for a few days after your surgery. A physiotherapist will visit you shortly to discuss an exercise plan to ensure proper recovery from the surgery. Once you leave the hospital, it is vital that you keep the area that was operated on clean and free from infection. You will receive special instructions on how to keep the wound clean. Continue to attend your physiotherapy appointments, as well as see your doctor. This is to ensure you are recovering properly from the surgery. Your doctor will ensure that no abnormalities arise. If your wound is swelling, take the NSAIDs prescribed to you to control the inflammation and swelling. You will also be instructed on how to properly exercise your knee. This is to ensure that you will have a full range of motion once you recovered. 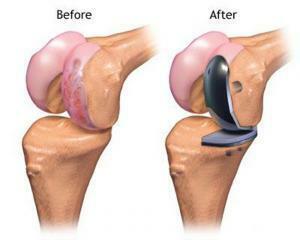 Knee replacement MAKOplasty and surgery generally give excellent improvement post-surgery. It is vital that you do not put weight on your knee while it is recovering, as this can cause the partial or complete collapse of the knee. Needless to say, try to avoid falls by being extremely careful, as any force placed on the knee during its recovery is not advised.